Finally winter is here! A handful of alpine ski resorts are opening their winter ski areas this week and next. Glacier ski areas have been open for weeks now, but it's the first winter ski area openings that always signal the official start of the ski season. OnTheSnow brings you all the November ski opening dates and the latest snow reports from the Alps. Solden ski resort - Now open! On Oct. 31, Solden declared it was Austria's first winter ski area to open, with a total of 16 lifts in operation. In addition to the 10 lifts on the glacier ski area, the following six in the winter ski area are in operation: 8EUB Giggijoch; 4SK Silberbrünnl; 8SK Giggijoch; 4SL Seekogl; 4SK Einzeiger; and 8EUB Gletscherexpress. Full-priced winter ski pass rates kick in Nov. 17; an adult pass will cost €45,50. Solden has a good blanket of snow already, with 88cm at the top (3,000m) and 40cm further down (2,525m). See OnTheSnow's Solden snow report. Obergurgl ski resort - Now open! At the end of October Obergurgl-Hochgurgl was inundated with powder – 60cm in 24 hours, laying a great base for things to come. Obergurgl is always one of the first non-glacial ski areas to open each winter, thanks to its high base and very high slopes (1,793-3,082m). The ski resort is celebrating its opening this year with a fun-packed 11 days of live music, family activities and reduced ski passes. All adults skiers pay senior rates Nov. 15-25. The ski resort is also offering a 20 percent discount on ski rental in all its sports shops during these 11 days. Obergurgl currently has 70cm of powder snow on the upper slopes and 35cm further down. See OnTheSnow's Obergurgl snow report. Zermatt ski resort - Now open! Ischgl's ski opening is celebrated in a week-long Festival Opening Week starting next Friday. Over the week, four concerts featuring international acts will take place, including German cult rock band The Scorpions at the legendary Top of the Mountain Concert, and admission is free with a valid ski pass. From Nov. 23, Ischgl's lifts will be open daily from 8:30 a.m. to 4 p.m. The resort currently has 60cm of snow at the top of the mountain and 10cm further down. See OnTheSnow's Ischgl snow report. Val Tho kicks off the ski season Nov. 24 with the Ski Force Winter Tour. The two-day Ski Force Winter Tour is a chance to test the new models from more than 16 leading ski manufacturers for free and benefit from professional advice. Val Thorens is offering a two-night Ski Force Winter Tour deal starting from €84 per person. It includes two nights' accommodation, a two-day ski pass for Val Thorens-Orelle, and free testing of ski equipment. Val Thorens currently has 60cm at the top of the mountain and 30cm further down. 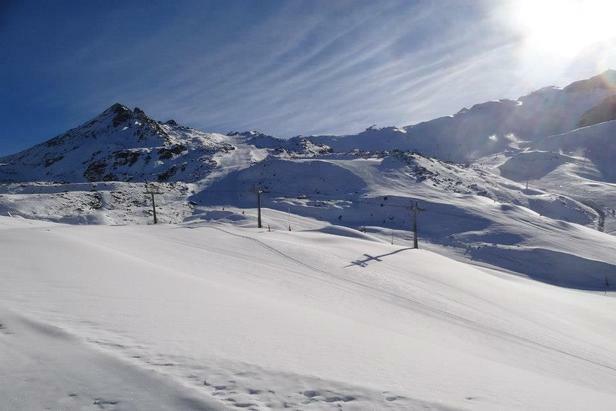 See OnTheSnow's Val Thorens snow report. To celebrate the start of the ski season, St Anton is hosting the Free XXL Ski and Snowboard test, with equipment from 19 top brands, and live music from 8 p.m. in the WM-Halle. Admission is free. St. Anton currently has 15cm of snow. See OnTheSnow's St. Anton snow report.